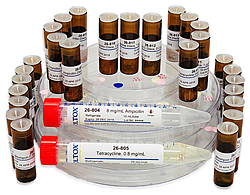 The MOLTOX® portfolio of antibiotics solutions and discs is specifically formulated for use in bacterial mutagenicity assays. Ampicillin is used for selecting pKM101-containing bacterial strains. Tetracycline is added to the culture medium for growth of pAQ1-containing strains (TA102). Mitomycin C, Ampicillin, Crystal Violet and Tetracycline discs are designed for our phenotype test kit or can be used separately. Choose from a variety of buffer for your specific purposes, e.g. Phosphate Buffer, Sodium Chlorid Buffer or Tris-HCL Buffer.